“As Above So Below” Anointing Oil – A blend to activate the 3rd eye (or 6th chakra) and our intuition. Pine, juniper and sage dwell in harmony in the arid mountains of the Southwest and their essences work together to align our mental, spiritual and physical bodies to help us connect to source while gently holding us in balance, grounded and at peace. The perfect blend for working with intuitive gifts through meditation, as well as soothing tension and anxiety. “Rise Up” Anointing Oil has clean scent to awaken the senses and activate the higher chakras, lifting us up and out of the physical plane to see the bigger picture, so we may release the burdens of everyday life and experience the unconditional love of Spirit. 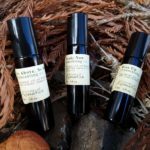 “Steady Now” Anointing Oil – A blend to bring all the chakras into harmonious balance. A great all-purpose, balancing oil that can relieve emotional or physical tension to achieve a feeling of restful ease.